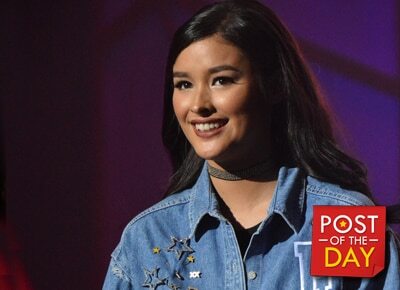 Liza Soberano posted a sweet emotional message for the cast and crew of Dolce Amore. Liza Soberano posted a sweet emotional message for the cast and crew of Dolce Amore. “And now sepanx is starting to kick in,” she confessed. She then thanked everyone who had been part of the show. “It was a privilege and honor to work with such amazing people these past 7 months,” she posted. And now sepanx is starting to kick in. ?? It was a privilege and honor to work with such amazing people these past 7 months. Thank you to our brilliant writers and to our amazing directors who helped us bring our characters to life! Thank you direk @maecruzalviar for guiding us each step of the way and for never loosing your patience ?? and of course thank you to the ever so cool second unit director Richard Arellano! Thank you to Star Creatives and Tita Malou for again trusting Quen and I to portray these amazing characters. To Tiyang Des, Ate Mylene and Ate @ms.macas for putting up with any trouble we may have possibly given you. Biggest thanks to Papa God for another Blessing. We couldn't have done all of this without you ???? oh and how can I forget to awesome production team of Dolce Amore, all the PA's, gaffers, camera men, assistant camera men, Damascus, crowd control, Kuya @ab_garcia, TD's, sound engineers, utility, wardrobe, stylists, props men, make-up artists @makeupbytanyaong and anyone else I may have forgotten to put. Thank you!!!! !